Two British soldiers have appeared in court accused of being part of an outlawed neo-Nazi group, with one alleged to have had the manifesto of Norwegian mass murderer Anders Breivik on his computer. Soldiers Mikko Vevhilainen, 32, a lance corporal, and Mark Barrett, 24, a private, are accused of being part of the far right group National Action, which was banned in December 2016. They appeared at Westminster Magistrates Court this morning alongside civilian Alexander Deakin, 22, who is also accused of being a member. All three are charged with being members of National Action between December 17, 2016 and September 5, 2017, contrary to section 11 of the Terrorism Act 2000. Vevhilainen, represented by Daren Samat (corr), is also charged with having in his possession a document titled “2083: A European Declaration of Independence by Andrew Berwick (Anders Breivik)”. The document is a manifesto written by racist Norwegian terrorist Anders Breivik, who murdered 77 people and injured 319 others in July 2011. Vevhilainen is also accused of two counts of publishing written material which is threatening, abusive or insulting, by posting comments on the website Christogenea.org, intending to stir up racial hatred. 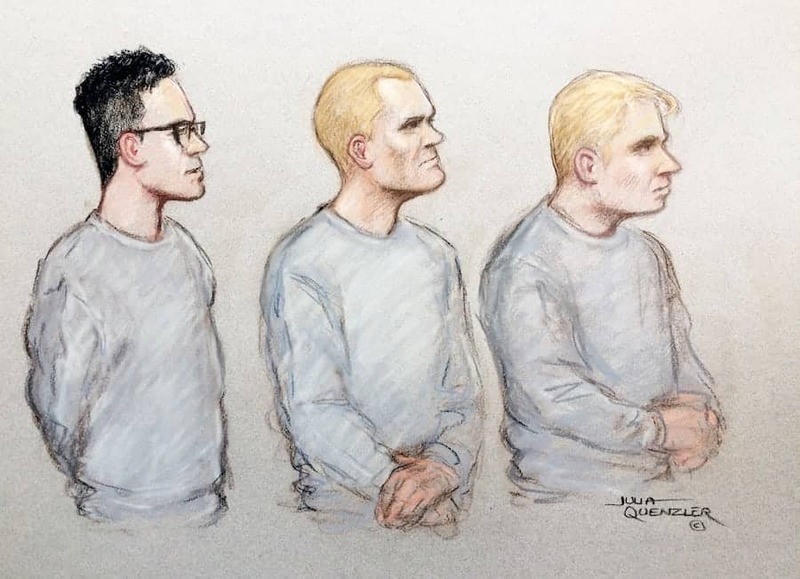 Artists impression of (L-R) Alexander Deakin, Mikko Vehvilainen and Mark Barrett, appearing at Westminster Magistrates Court. September 12 , 2017. Two British soldiers have appeared in court accused of being part of an outlawed neo-Nazi group, with one alleged to have had the manifesto of Norwegian mass murderer Anders Breivik on his computer. The posts are alleged to have being published on April 2, 2016 and September 2, 2016. He faces one other count of possessing a weapon designed or adapted for the discharge of a noxious liquid – namely pepper spray. Vevhilainen, wearing grey joggers, a grey sweater and with a short buzz haircut, entered no plea to his charges. Dad-of-two Barrett, also appearing in grey joggers and a grey sweatshirt, with short blonde hair, pleaded not guilty to being a member of the group. He was the only defendant to enter a plea at the hearing. Defending Barrett, Shane Hennigan said the army are ‘standing by’ him. He said: “The army are standing by this defendant. Deakin, represented by Kevin Smallcombe, was also charged with having a file on his computer called “Mega Folder”, containing information of that kind likely to be useful to a person committing or preparing an act of terrorism. He also faces another charge of possessing a document called the “White Resistance Manual for fun”, containing information of that kind likely to be useful to a person committing or preparing an act of terrorism. Deakin is also charged with a third count of having shared a publication called “Ethnic Cleansing Operations” to three people via Skype. Appearing in the dock wearing a grey sweatshirt, grey jogging bottoms, glasses and with short dark hair, he entered no plea to any of the charges. Deakin, of Beacon Road, Great Barr, West Midlands; Vevhilainen, of Sennybridge Camp, Brecon, Powys; and Barrett, based at Dhekelia Garrison in Cyprus, were remanded in custody. Chief magistrate Emma Arbuthnot said: “You’re all three being sent to the Central Criminal Court because my powers of sentence are insufficient in this case. “The first hearing there will be on September 21 and that will be a short hearing, initially a case management hearing on that date. She said Barrett’s bail would be considered again after a discussion with an army captain who was present in the public gallery. All three men were charged following an investigation by West-Midlands Counter-Terrorism Unit and the Ministry of Defence. National Action was added to the government’s list of outlawed organisations in December 2016 on the grounds it is ‘virulently racist, anti-Semitic and homophobic’. Prosecutor Jessica Hart said: “These three defendants have all been part of a telegram chat which the crown says is being used by National Action to organise post proscription. “Searches of their properties and their devices have revealed copies of the materials seen in the case summary. “Mr Deakin and Mr Vevhilainen were members prior and post proscription. She added: “The crown would say they support the aims and objectives of the organisation National Action.